Most of the science writing we lay-people get access to is potted summaries of cool things scientists have found. Or less potted and more mind-boggling actual papers. That’s why I like the @RealScientists Twitter feed, because it gives a warts-and-all view of the daily life of a scientist. It’s a bit like a scientists zoo. 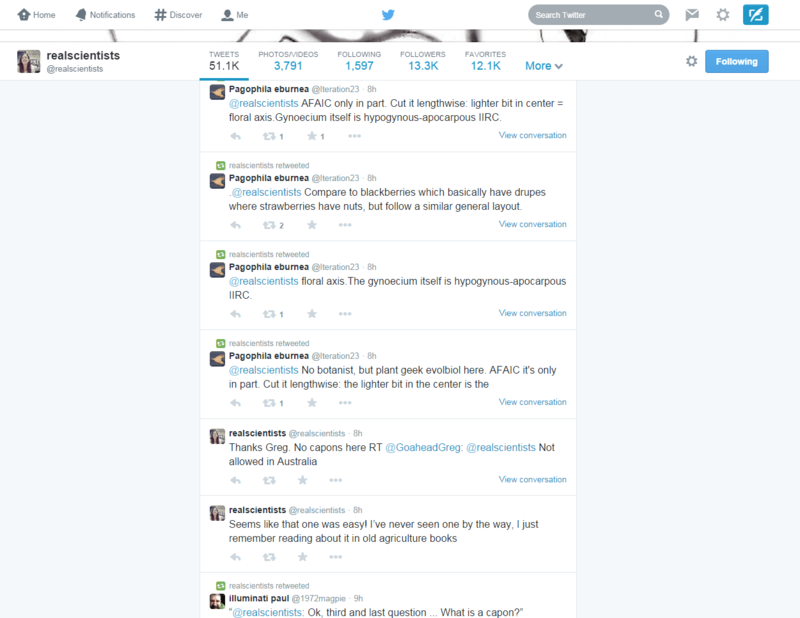 The @RealScientists Twitter feed is rotational, so a different scientist drives each week. That makes for entertaining variety but also, to be honest, quite variable quality. Sometimes you see debate about scientific topics, sometimes an insight into the trials and tribulations of science funding, sometimes calls for more coffee and muffins. Personally I find that endearing, and throughout it all you get some idea of what it is like to work as a scientist in today’s Australia. Real Scientists have a website with a summary of what they are all about. introductions to the scientists, and how to get involved with them: www.realscientists.org. But more importantly follow them on Twitter.